Finally! 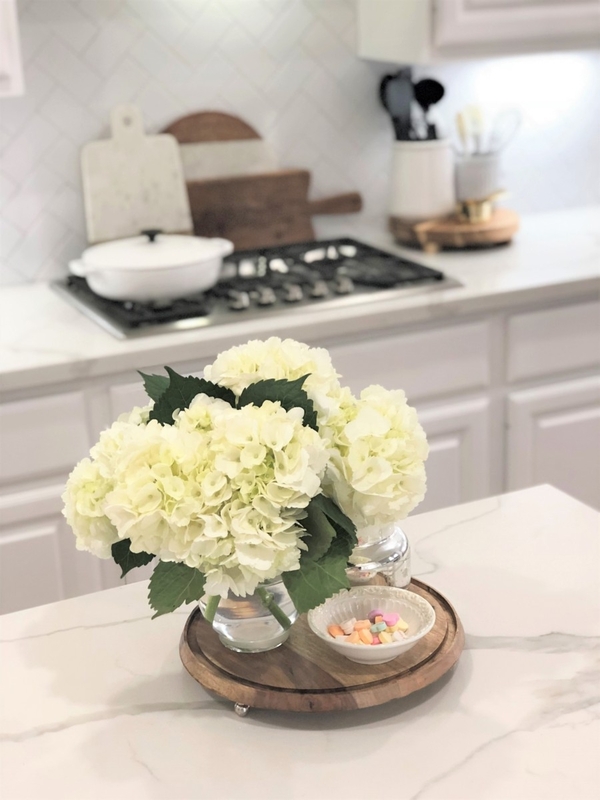 A home improvement update for you guys! 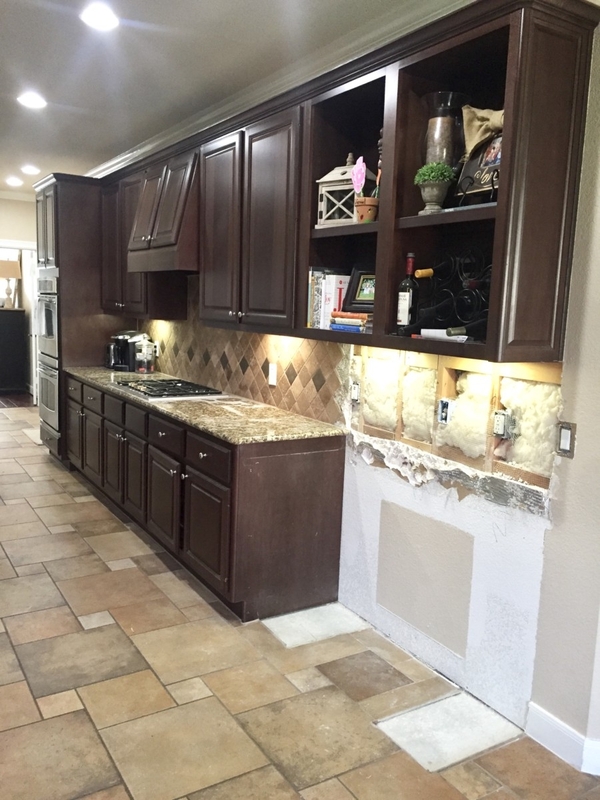 The reason this has taken so long to write is because the remodeling process is a slow one. We had a few hiccups along the way including the most devastating hurricane to hit the US. We had initially gutted parts of our home before the hurricane. 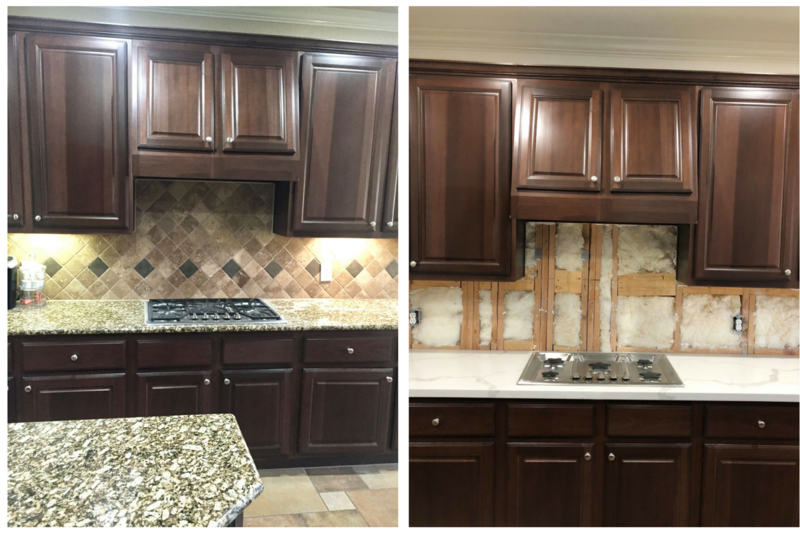 After the hurricane, it was near impossible to find craftsmen to help with tile, cabinets, paint, etc. 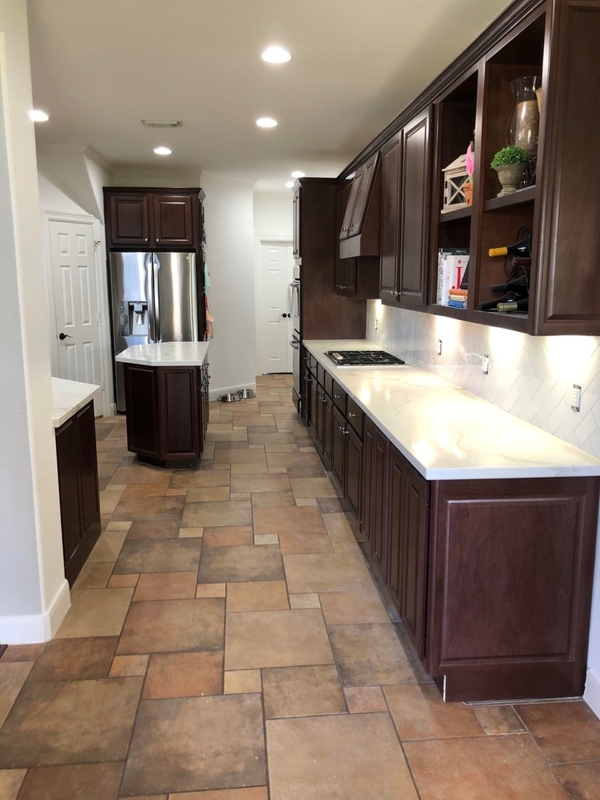 We wanted to try and find someone who was used a general contractor software to help with our remodelling, but it was difficult to get exactly what we wanted at the time. It’s not even just the craftsmen that we need help with but we also need to get ourselves a water softener system. Luckily one of my friends have recommended that we get our Water Softeners from Minimax but we’re still just trying to get our house sorted first, even though it feels like it’s taking ages. We understood and were beyond grateful to be spared during the hurricane and had to go with the flow. Before the kitchen was a traditional dark kitchen. 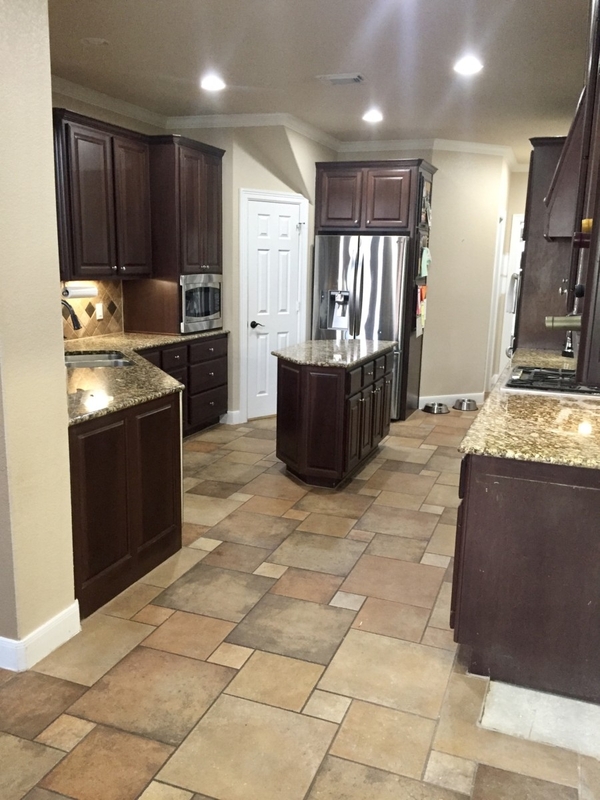 It had dark wood cabinets, dark brown and cream granite and rust colored tile flooring. The backsplash was also a dark tumbled tile with turquoise accent tiles. The walls were also beige. 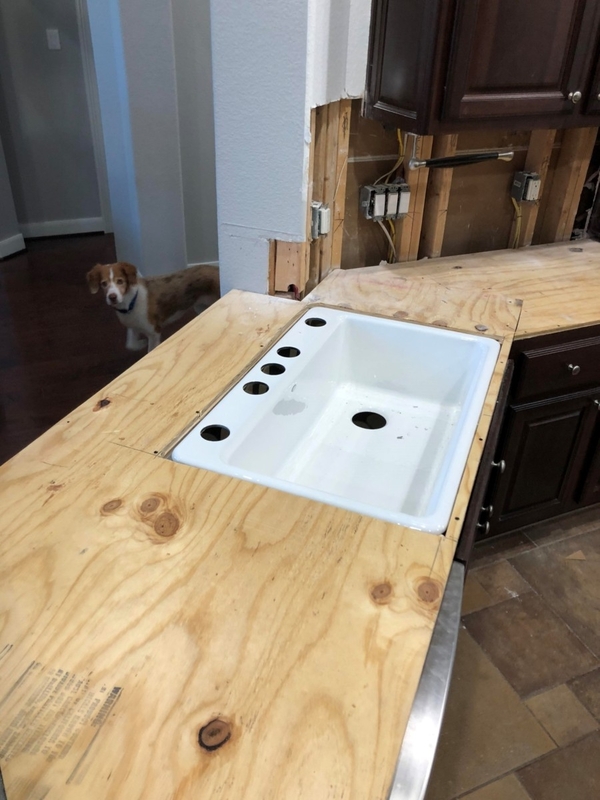 The counter behind our sink was bar height and blocked off the view of our family room. 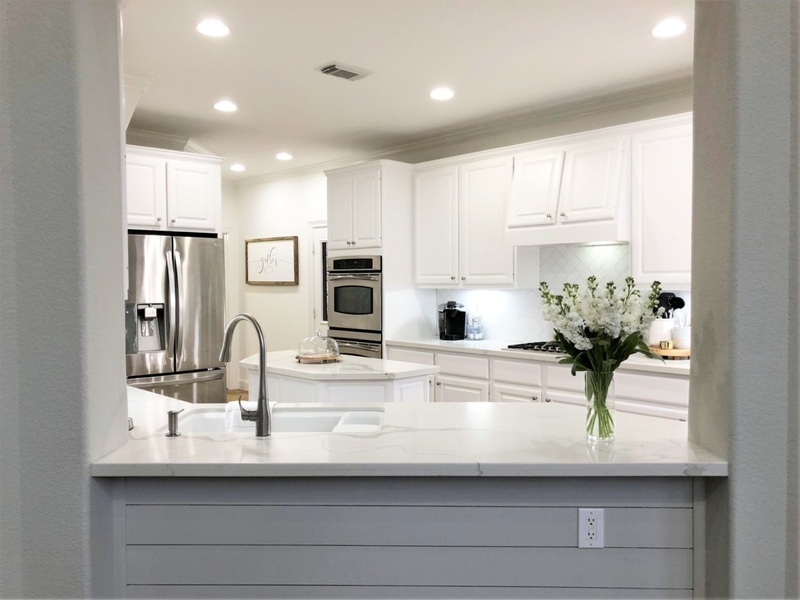 We have load bearing supports holding up our house so moving the beams and making the island bigger was not an option. Instead, we decided to remove the bar height counter and make the counter tops all one level to open up the space. For some reason we had a desk in our kitchen! This was basically 6 small drawers and counter space used to hold junk. We agreed it was wasted space and ripped the desk out. Here are our new counter tops! 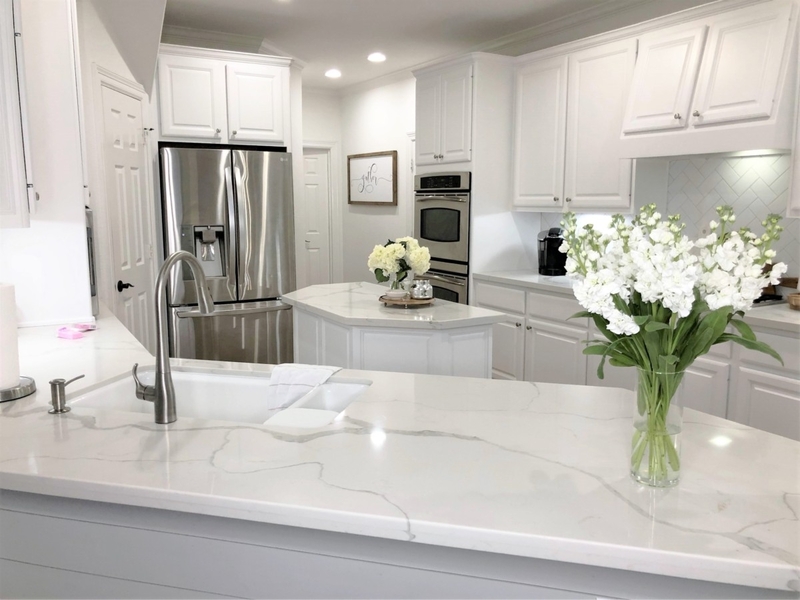 We went with a quartz counter top for maximum durability. They are stain resistant and won’t scratch or etch. On the very end you can see we added cabinets where the desk space was and the counter tops now go all the way to the end. The double doors on the cabinets were not what we had ordered. They have since been removed and a large single door is on each cabinet. We replaced our stainless steel sink that had a large and small basin with an undermount cast iron sink. 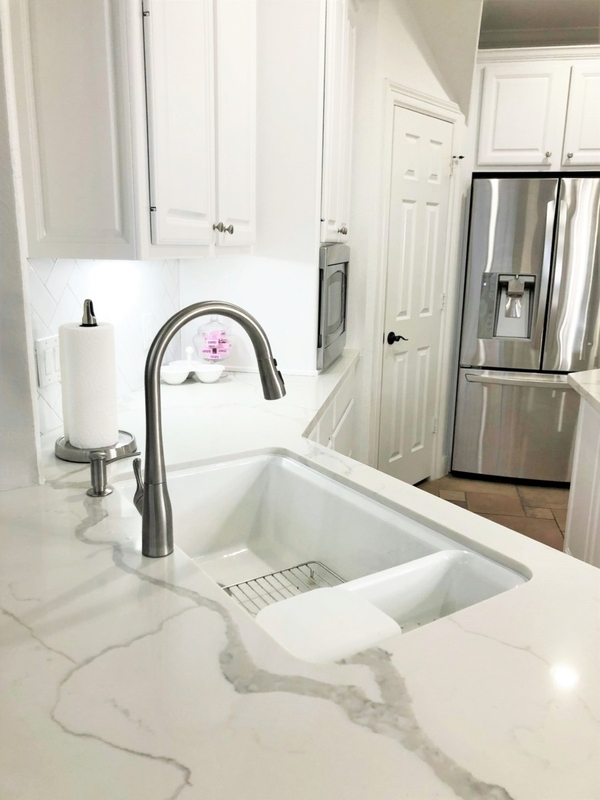 We debated on a farmhouse style sink but because of the angles between the cabinets and the dishwasher, we agreed it would stick out too far or not fit properly in the space. 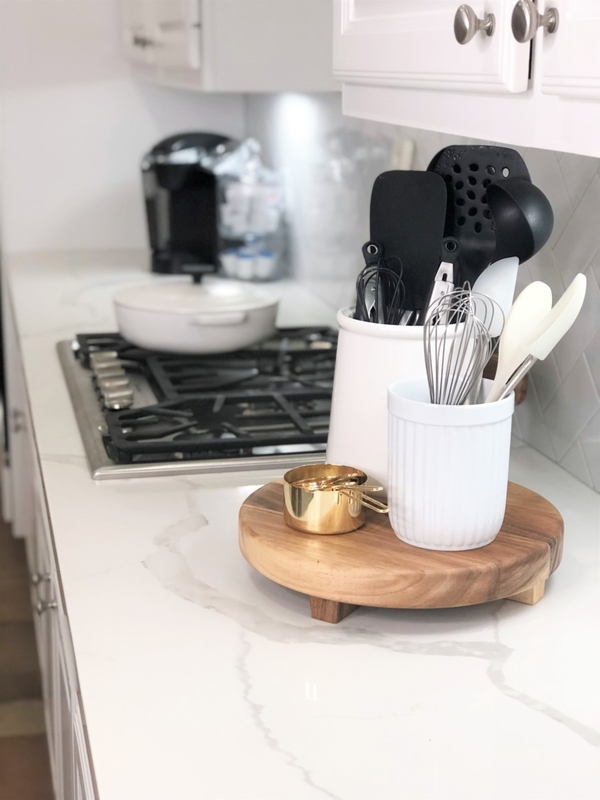 I also wanted the new lower counter top space to be as seamless as possible. 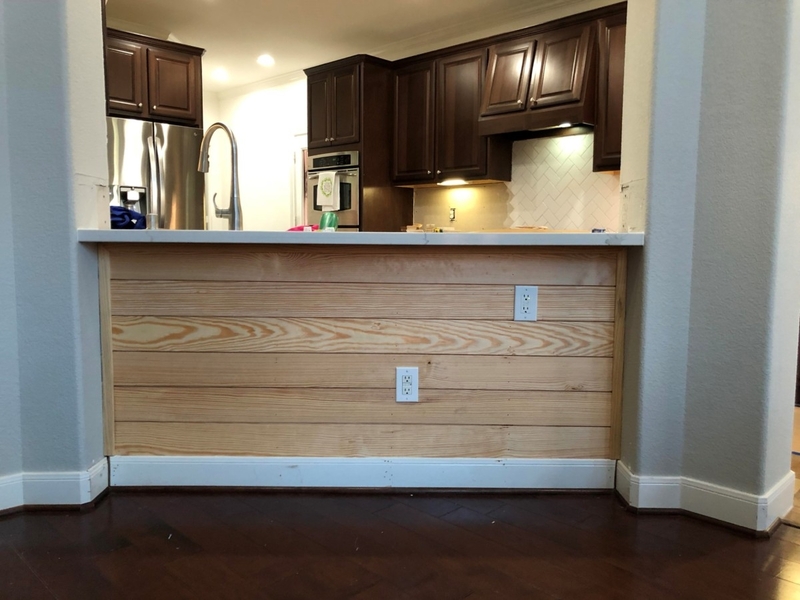 Below, we added shiplap to the wall to give it dimension and interest. This was a DIY done by my husband. 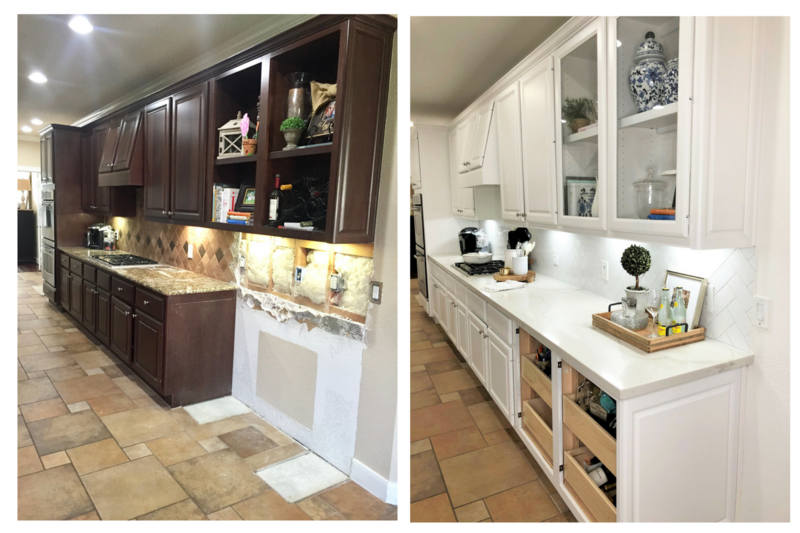 I was really proud of Justin for taking on some of my crazy home improvement projects himself in order to save money and stay on budget. A few months prior, we upgraded our four burner gas stovetop to a five burner. I enjoy cooking and really wanted a larger stovetop for my pots and pans. We gifted the old one to our friends who had an electric stovetop with gas hookups! 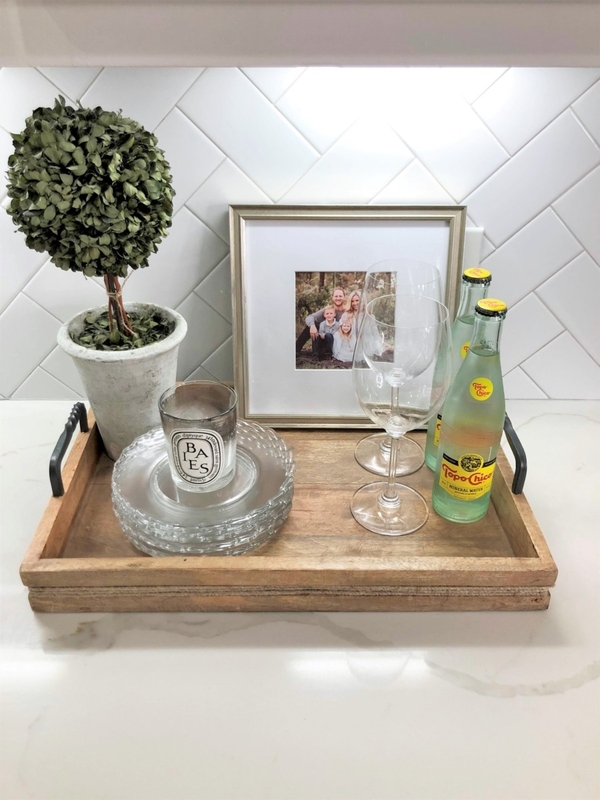 You can always find my home decor items HERE on the blog. 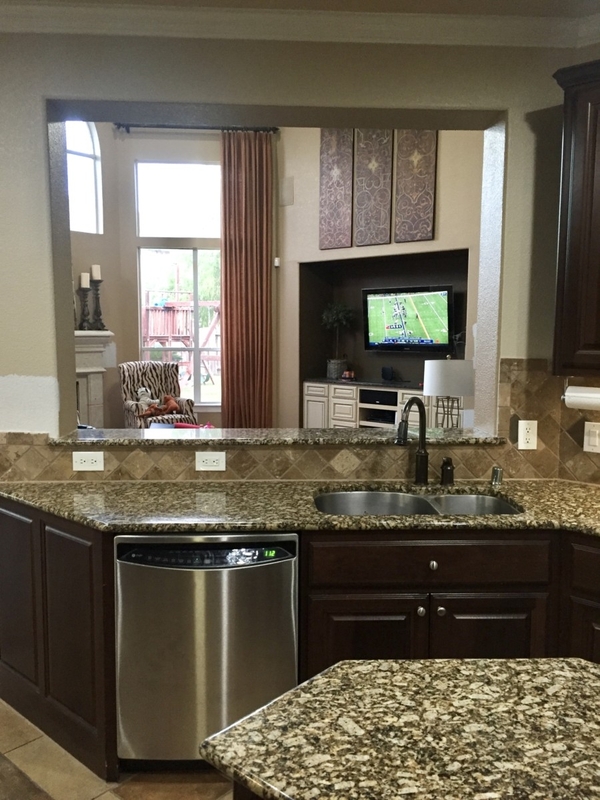 Love the kitchen remodel! It looks so great. It has been fun to watch the process on insta-stories. Thanks for sharing. Thank you Heidi! Hopefully it will all be completed in a month or so! Thank you Angela! Hopefully it will be complete in a month or so! Looks great! I’d go with a darker bronze cabinet hardware – Venetian Bronze or something like that! Thanks Pamela! I love the idea of Venetian Bronze! Gorgeous! Love your choices! 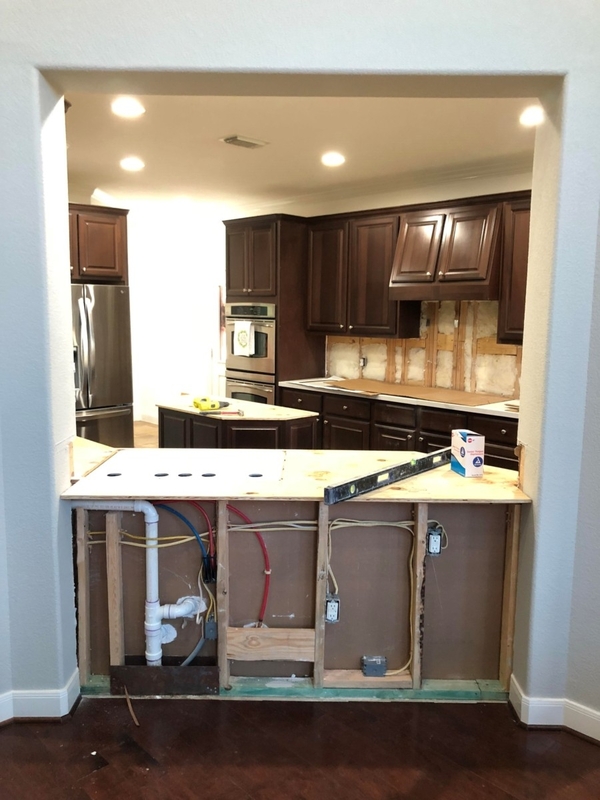 I am in the DFW area and wanted to start a kitchen remodel last summer also, but had to postpone it. Then Harvey made materials and workers scarce and more expensive here. I hope to start sometime this Spring. Good luck with the rest of yours. This looks wonderful! I’m in the middle of a kitchen update and we are also lowering the bar to counter height. So happy to see how yours turned out!! Thank you for sharing! Thanks Amy. 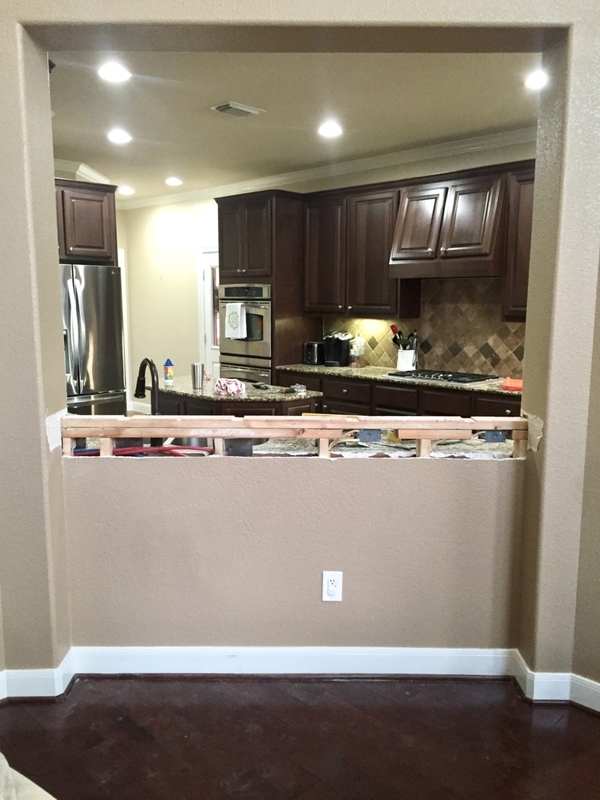 We love how the lowered bar height really opened our kitchen since we couldn’t remove that pesky beam. Good luck with your remodel! This is cool and helpful tips when you decide to sell your house and want to increase its value. Donna recently posted in How to select a best electric fireplace for your home.